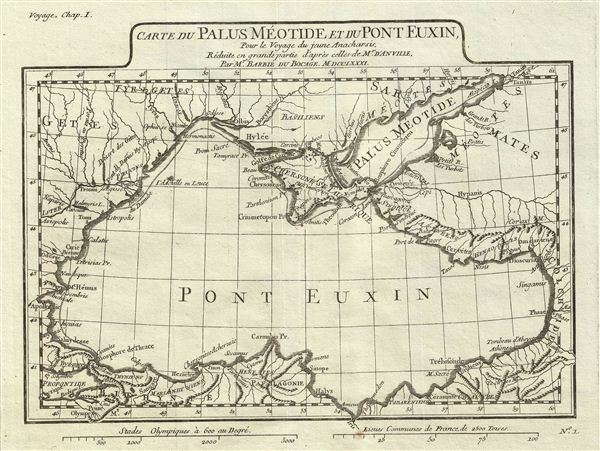 Carte du Palus Meotide et du Pont Euxin, Pour le Voyage du jeune Anacharsis. This is an attractive 1791 map of the Black Sea and the Sea of Azov. Take from an earlier D'Anville map, Barbie de Bocage's map covers the Black Sea (Pont euxin), the Crimea, and the Sea of Azov (Lake Maeotis), identifying various sites along their shores. It was here that the legendary Golden Fleece sought by Jason and his Argonauts was said to lie. Prepared by M. Barbie de Bocage in 1791 to illustrate the Travels of Anacharsis.